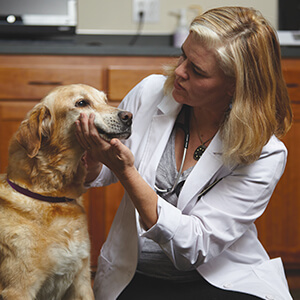 Dr. Belle Nibblett is a board-certified specialist in small animal internal medicine and a Diplomate of the American College of Veterinary Internal Medicine. Her clinical areas of interest include infectious disease, endocrinology and the role of stress in disease. She is skilled in medical procedures including transtracheal wash, various endoscopic techniques and chemotherapy. Dr. Nibblett received her Doctor of Veterinary Medicine degree from the University of Saskatchewan in 2000. After five years as a general practitioner in Fort Wayne, Indiana, she returned to the University of Saskatchewan and completed a small animal medicine residency and Master of Veterinary Science. Dr. Nibblett joined the faculty of Ross University School of Veterinary Medicine, teaching such topics as endocrinology, gastroenterology, nephrology, urology and oncology. Dr. Nibblett’s publications in the field of veterinary medicine have focused on validation of teaching models for clinical examination skills, various infectious diseases, bleeding disorders and cortisol studies.